That's what my partner asked me a while ago. "I know why you use handtools, but what's the intrigue with antique handtools?" "Well", I explained, "it's because...well...hmmm, let me think about it." I use handtools in general because 1) sawdust makes me cough 2) by working with handtools, it seems more like I'm shaping the wood rather than a power tool creating the shape 3) I don't waste as much wood by making practice cuts 4) the set up time is faster 5) it's quiet 6) it's a great workout 7) it's safer 8) wood shaped with handtools seems to have more character (in my opinion), 9) handtools have personality and there is synergy between the user and tool that I've never felt with my power tools (except for my band saw—I love that guy), 10) you can do things with handtools that you can't do with power tools (skinny little dovetails, for instance) and 11) I just like it. The first thing that popped into my head is that some tools are no longer manufactured, so an antique is your only option. But that's not really my reason for buying and using them. I use antique tools purely for nostalgic and aesthetic reasons. I love the dings, dents, owners' marks, patina, feel, and historical aspects of them. They are a link to our past and as I use them, I think about the previous owners and sense a connection. There's also something physically different about antique tools; it's like you're sliding your hand into a favorite, well-worn glove. Could be that years of use have altered the shape slightly so they fit more comfortably in your hand than new tools. 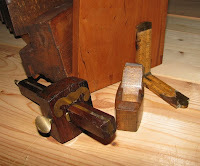 And where I believe handtools have personality, antique ones are full of character. You'll find everything from crotchety curmudgeons to quirky & finicky great-uncles to gentle & wise old grandfathers. So, I ask you....what's your intrigue with antique tools?